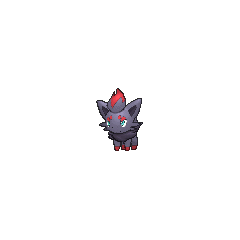 Zorua in game: 2,963 Who? Important notice! Pokemon Zorua is a fictional character of humans. Zorua (Japanese: ??? 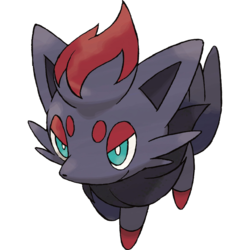 Zorua) is a Dark-type Pokémon introduced in Generation V.
Zorua keeps its true form hidden to ensure its safety, and takes on the appearance of other Pokémon to frighten off enemies. Sometimes it will take the form of a silent child. As evident in its movie debut, whenever a Zorua takes on a human form, its tail remains. When the tail is touched or grabbed, it reverts to its true form instantly. It is mischievous and loves to surprise others. Zorua debuted in the thirteenth Pokémon movie, Zoroark: Master of Illusions, where it was used by the antagonist, Grings Kodai, to blackmail its foster mother Zoroark into attacking Crown City. It escaped and met Ash and his friends, before befriending Celebi. Zorua and Celebi were captured by Kodai, but were able to defeat him with help from Zoroark and the three Shiny Legendary beasts serving as Crown City's guardians. A female Zorua under the ownership of Luke made its anime debut in Movie Time! Zorua in "The Legend of the Pokémon Knight"!, when she refuses to play multiple roles in her Trainer's film. After reconciling with Luke, the Zorua took part in the film as the princess who is kidnapped. She is actually kidnapped later on by Team Rocket and rescued by Cilan and Ash. This same Zorua reappeared with her Trainer in Reunion Battles In Nimbasa! through Club Battle Finale: A Heroes Outcome!, in which she was constantly smothered by Bianca, and again in An Epic Defense Force!. 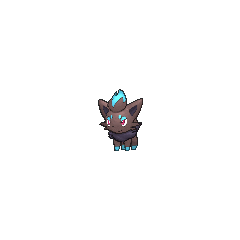 A Zorua appeared in a flashback in The Island of Illusions!. It was a Pokémon taken care by the Nurse Joy years in the past. It eventually evolved into a Zoroark. A photo of a Zorua appeared in The Four Seasons of Sawsbuck!. 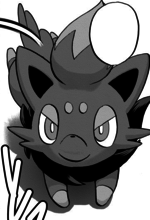 A Zorua appeared in Castelia City where it fought Black's Tep, teasing it throughout the entire battle before escaping. The same Zorua later appears to wreak havoc on the Driftveil Drawbridge. Later, it is revealed that this Zorua worked alongside N.
Increases damage done by any Dark types in a combo. Zorua is likely based on a fox cub, with facial markings resembling Kabuki or Noh theatre makeup. 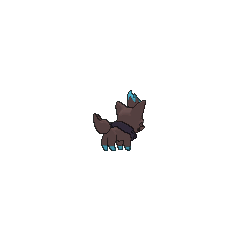 The concept of a Zorua still having its tail while in human form, is similar to the Japanese folklore of the kitsune, a shape-shifting fox who, in some stories, has difficulty of hiding its tail when it takes on human forms. 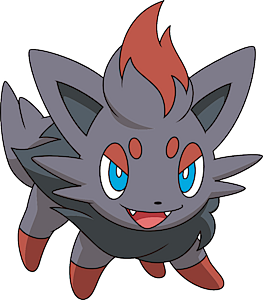 Zorua may also be based on ninjas due to its special ability to use and fight with illusions, which can be considered a genjutsu (illusion technique).